Fasting that Breaks Barriers – HOLY SPIRIT OUTPOURING!! You’ve commanded, rebuked, prayed prayers, done warfare and shouted, but there’s more that needs to be broken off your life. It’s time to add some fasting to your warfare strategy. There is no other way around some demonic strongholds. No shortcuts. You have to fast and humble yourself until that thing breaks and leaves your life. Demons are different in terms of their wickedness. There are demons that are stronger, more wicked, unclean and stubborn, and higher in rank, ability and intelligence. The longer a demon has been in your family or in your life, the harder it is to remove because its roots go very deep. Demons such as rebellion, pride, witchcraft, Jezebel, poverty and lack may only come out with a high level of faith. Sometimes it: seems as if they cannot be dislodged, and people -will get discouraged and frustrated and feel they have failed. In Matthew 17, the disciples of Jesus encountered a demon in a young boy and could not cure him because of their unbelief. Unbelief hinders us from dealing with strongholds. It takes faith to dislodge the enemy. Fasting helps you overcome unbelief and build strong faith. This is the supernatural combination that Jesus gave His disciples in Matthew 17: prayer and fasting. I am not saying that when you fast you will earn brownie points with God or that you are working your way to enjoying God’s blessings. We don’t fast to be saved, please God, or go to heaven. There is no law that says if you don’t fast you will go to hell. We fast for breakthrough and revival, for family and loved ones. For the weapons of our warfare are not carnal but mighty through God! Sometimes you have to do something unusual, extraordinary and beyond the norm to see breakthrough. Normal church, normal Christianity, normal preaching and normal praying are not going to get the job done. Some little, sweet prayer is not going to do. Religion won’t get it done. It is going to take an anointing that destroys the yoke. When you fast, the anointing increases in your life because you are so into the Spirit. The authority of God, power of God and faith of God come alive when you lay aside some things and fast. You will find yourself getting stronger and stronger. Shouting doesn’t do it; the anointing does. Isaiah 58 talks about how we can fast to break every yoke to undo the heavy burdens. Fasting makes room so that the oppressed go free. 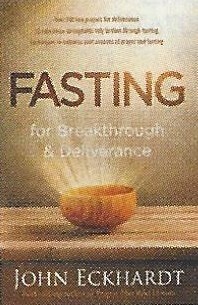 Fasting breaks bondages and causes revival. When you are dealing with a serious issue-maybe you are dealing with something you don’t know how to handle-the best thing to do sometimes is to let go of some food for a little while. Pray against that thing. Man may not be able to help you, and you may not know how to defeat it, but with God, all things are possible. 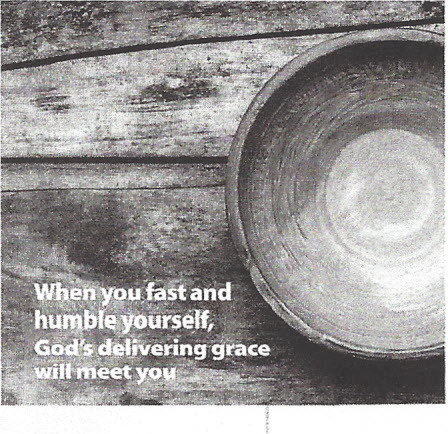 As you fast and humble yourself, the grace of God will come upon your life. The Lord will be the strength of your life. What you could not do in the flesh you can do by the Spirit of God, because it’s not by might nor by power but by the Spirit of the Lord that every mountain is removed! Listen, extraordinary situations require extraordinary measures. Sometimes it only happens when you get desperate-when you are so tired of being defeated and hindered in an area. Let’s see some victories we haven’t seen before. Let’s get some breakthroughs we haven’t had before. Let’s see some miracles we haven’t seen before. Let’s drive out some demons we haven’t driven out before. Let’s see some curses broken that would not leave. Let’s see some generational strongholds uprooted that could not be uprooted. Let’s see a change! Not once. Not twice. Not even three times. If you have to fast more times than that, do it. Don’t give up. Keep doing it. Keep going until you know you have victory, until you have breakthrough, until you sense something breaking! You have to get so tired of the devil that you say, “Enough is enough. If I have to turn my plate down to get a breakthrough in this area, I won’t eat.” When your stomach starts screaming, tell it to back up. In the end, you will win and have victory! Let our spiritual enemies be smitten and consumed in Jesus’ name! This is the faith and unshakeable resolve fasting will build in your life to see deliverance in every area the enemy has tried to control. Fasting is beneficial whether you fast partially or fully. One day fasts on a consistent basis will strengthen your spirit over time and give you the ability to discipline yourself for longer fasts. Three day fasts with just water are a powerful way to see breakthroughs. Esther and the people of Israel went into a three day fast when they were seeking deliverance from death at the hand of Haman, the king’s evil adviser (Esth. 4: 16). Fasts lasting longer than three days should be done by people with more experience fasting. I do not recommend long fasts unless there is an emergency or if one is led by the Holy Spirit to do so. Daniel fasted 21 days and saw a great breakthrough for his people (Dan. 9-10). Daniel was also a prophet, and God will use prophets to fast for different reasons to see breakthroughs. Jesus fasted 40 days before beginning His ministry (Matt. 4:1-2). Moses and Elijah also fasted 40 days (Ex. 34:28; Deut. 9:9,18; 1 Kin. 19:8). I do know of people who have fasted 40 days and have seen great breakthroughs. A partial fast can include some food such as vegetables and can be done for long lengths. Complete fasts consist of only water, and water is important to cleanse the system of toxins that are released through fasting. The Holy Spirit will be revealed to you when you need to fast. A fasted lifestyle is a powerful lifestyle. In Jesus’ day, the Pharisees fasted with attitudes of pride and superiority: “The Pharisee stood and prayed these things about himself, ‘God, I thank You that I am not like other men … I fast twice a week” (Luke 18:11-12). Anytime you are full of pride, being legalistic and religious, you can fast and pray all you want, but you won’t see many miracles. The Pharisees didn’t have any miracles come as a result of their prayer and fasting. Always be humble. Always be merciful. We must approach fasting with humility. Fasting must be genuine and not religious or hypocritical. This is what God requires. The rewards of fasting far outweigh the obstacles of the enemy. Fasting has great rewards. Many believers are unaware of the great rewards that come through fasting. God promises rewards to those who fast in secret. Reward is God’s favor, abundance and blessing. The open rewards of fasting include blessing, abundance, favor and prosperity. Learn the secret of obtaining God’s reward through private fasting. No one needs to know you are fasting. As the Holy Spirit leads you, make this a personal discipline between you and God and see how He rewards you. “And without faith it is impossible to please God, for he who comes to God must believe that He exists and that He is a rewarder of those who diligently seek Him” (Heb. 11 :6). For a slightly different approach, pray and declare the promises God gave His followers in Scripture: “I will fast according to the fast chosen by the Lord (Isaiah 58:5).1 will set my face toward the Lord God to make requests, by prayer and supplication, with fasting, sackcloth and ashes (Daniel 9:3). I will proclaim a fast and humble myself before our God, to seek from Him the right way for my family and all our possessions (Ezra 8:21). l will turn to the Lord, with fasting, weeping and mourning (Joel 2:12). I fast to loose the bonds of wickedness, to undo heavy burdens, to the let the oppressed go free, and to break every yoke). I will fast in the secret place, and my Father, who sees in secret, will reward me openly (Matthew 6:18) I will not depart from the temple of the Lord but will serve God with fasting. JOHN ECKHARDT is overseer of Crusaders Ministries in Chicago. Gifted with an apostolic call, he has ministered throughout the world. He is a conference speaker, produces a weekly television program, Perfecting the Saints, and has written more than 20 books. Eckhardt lives in the Chicago area with his family. Author and speaker John Eckhardt reveals how fasting can break spiritual strongholds in Fasting for Breakthrough: Pray. Believe. Receive (Charisma House). You can find his book. which includes over 200 prayers for deliverance, at amazon.com, christian book .com or anywhere Christian books are sold.